I wasn’t overly enthusiastic about Johanna Garpe’s Carmen three weeks ago, but the reprise of her Dialogues des Carmélites is quite another matter. It was originally premiered on 22 October 2011, but for various reasons I was unable to see it then, so unbiased by previous experience (or even reviews, since I had read none) I could start from scratch. I am familiar with the work, and felt once again that it takes some time to arouse one’s interest, but after the interval and up until the tragic end it is utterly gripping. The three-act structure of the original was abandoned in this production and the break is in the middle of Act II, when Chevalier de la Force announces that he wants to see his sister Blanche. Most of the action takes place in the empty, round chapter room of the convent but there is an early flashback showing the de la Force family in their luxurious dwelling with period costumes and furniture. The uniforms worn by the revolutionaries when they invade the convent are also period dress. Otherwise, the nuns appear in their traditional attire – or, when disguised, in everyday, timeless clothes. The focus is on the central characters among the nuns and their sisters as a collective. The depiction of everyday life in the convent is seems quite authentic and is based on what director Johanna Garpe and dramaturge Katarina Aronsson experienced during their preparations for the original production back in 2011, when they visited a Carmelite convent in the south of Sweden. The horrible final scene is toned down – in the original the nuns march to the scaffold singing ‘Salve Regina’, before being guillotined. Instead, they stand side-by-side, singing and falling to the ground dead one by one, until Blanche is alone, sings the final lines and joins her sisters in death. It is still touching and frightening, but the scene is nonetheless comforting by virtue of the music and the faith expressed by the nuns. 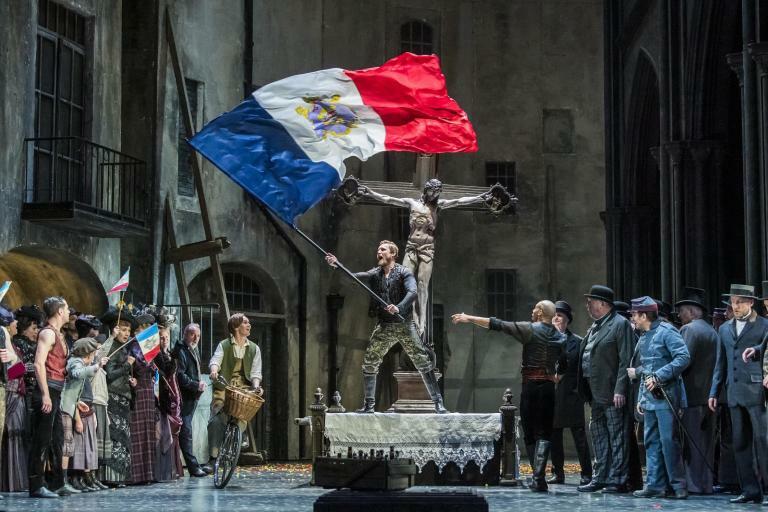 This opera can conjure up a very special, almost hypnotic feeling: I once saw it at Savonlinna in the Olavinlinna Castle, where the raw medieval setting conveyed a sense of historical realism, and yet this sparse staging manages to create the same atmosphere. Poulenc’s creation has stood the test of time, musically and dramatically, as only few other post-Puccini/-Strauss operas have succeeded in doing. It is timeless in the best sense of the word, in spite of being so distinctly linked to its historical background. With Marc Soustrot in the pit, the music was in the safest possible of hands and the line-up of singers, with some internationally renowned guests, could hardly have been better. By now veteran tenor Klas Hedlund and his younger colleague Joel Annmo are in top shape, the latter going from strong to stronger. 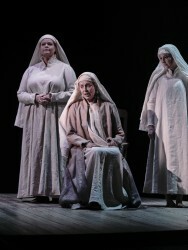 Anne Sofie von Otter made a deep impression as the old prioress who dies a painful death, Susanne Resmark was a monumental Mother Marie and Camilla Tilling, who has not been seen in an opera role on her home turf for quite some time, was a sensitive Blanche. And we should not forget Sara Olsson’s Madame Lidoine, the new prioress, as well as Sofie Asplund’s delightful Sister Constance. There are only three more performances scheduled for this season, but I hope it will on the bill again soon.